We at UNO have long believed that two is better than one, and now we’re making it official! If you like UNO, you’ll love UNO DOS! In the beloved card game UNO, you (or your team) are trying to be the first to score 500 points. You score points by being the first to get rid of all the cards in your hand, and action cards let you make things more difficult for your opponents. 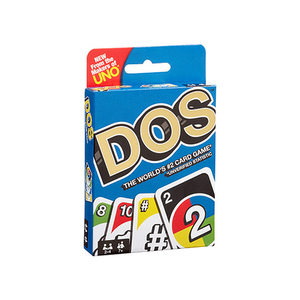 In this twist on the family favorite game, now when you’re down to two cards, don’t forget to yell “Dos!” See why this color coded card game has been a hit for so many years. Game comes in a colorful, protective tin that stores the included 108-card deck plus instructions, scoring pad, pencil. for 2 to 10 players. Ages 7 and older.